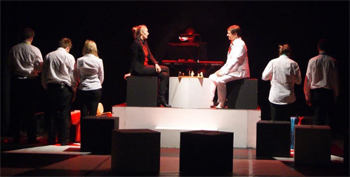 Game of Souls started its life entitled 'Chess Pieces' which I saw at Salford Arts Theatre back in 2013 with its own troupe of dancers embedded for dramatic effect. This refined production was leaner and sharper than its earlier outing and shows that Arts Council funding doesn't always mean a pampering of productions that should otherwise fall by the wayside. John Waterhouse has made good use of the support he's received to take the play further and get a much better performance out of the script as a consequence. The tagline says it's a comedy with music, but it felt very much like a morality play about our own capacity to be autonomous and purposeful in the face of hidden manipulations by forces seemingly beyond our control. The play centres on two demons who try and outdo each other by manoeuvring the minion earthlings under their influence in order to cause greater damage to the other demon's characters, and win the game they're playing. The two demons, Sanctimosa (Stacey Coleman) and Angelo (Nathan Smith) are poised in a raised position toward the back of the stage like puppet masters, loftily lording it over their humanoid actors. There are however no direct strings for the demons to pull on as the characters they draw into play are moved into position as chess pieces on the board between the demons. This restrictive setup invites the audience to weigh up how much our own free will genuinely helps us as individuals and how much they are part of someone else's plans to shape their own circumstances. Whilst the backdrop of the play is rather profound the delivery is delightfully light-hearted, sending up the self importance of the characters acting out their roles with some great camp humour that could be from a 70's sitcom. The various scenes are interspersed with song and playful music written and performed by Jak Poore who has pitched the score perfectly so there's no way you take any of it too seriously. Although the sharpest send up of the characters on the chess board is reserved for celebrities, there is a strong undercurrent to the social status of the pieces being introduced by the demons, and the way in which power tends to create distorted and nasty characters. The career Tory boy Giles Newsome is played confidently by Barrie Ryan English who captures the manipulations and wiliness we are encouraged to believe of politicians, yet he switches to the more sombre behind-the-scenes character of the civil servant Crown-Derby so effortlessly that I was left checking my programme to see if it was the same actor. Giles is Angelo's 'king' on the chessboard, introduced to be the bruiser piece to anything Sanctimosa may introduce. The point that we should question the motives, intentions or likely outcomes of everyone around us is driven to us hard with Sanctimosa launching her assault through her 'queen' piece, the pop star Ruby Ellerman (Daisy Leigh) who lands on stage in an affair with Giles. The script takes no prisoners in who and what it is skeptical or distrustful of, and I really liked the way that the Parliamentary Committee for Standards and Conduct is used in the form of Harriet Ponsonby (Emmy Fyles) who drops by change the dynamics in the liaison between the main protagonists for her own manipulative reasons. Harriet's sniffy holier than thou demeanor is played out in all its irritating insincerity by Emmy and all credit to John Waterhouse for being consistent in including this latest tactic from politicians to leverage advantage with the Orwellian Newspeak of whiter than white cleanliness. 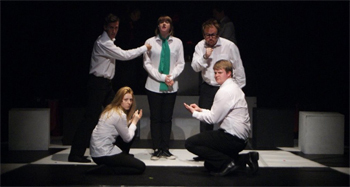 The songs in the play aren't the traditional musical style and have a personality all of their own, helping to maintain the lampooning format, yet with serious satirical ontent embedded in them. Maybe there's too many styles, formats, switches and changes of pace for me but it certainly keeps things from becoming staid. The lighting deserves and stage set design and production were great and maintained the feel of this production as a serious step change from its earlier outing in Salford. The characters being manipulated on stage by the super-human or other-worldly characters that manipulate them, have something of an epiphany moment toward the end as the play forces out who the audience should sympathise with - the demons manipulating us or the demons inside us, driving us on, or indeed whether we'd all be better off transcending our demons and shaping a different destiny for society. I suppose in the absence of a more purposeful sense of agency in society at large, it will always a little odd to see the demons and protagonists get their comeuppance in a way that isn't a little trite, but think it left me wanting a little more bite from it.